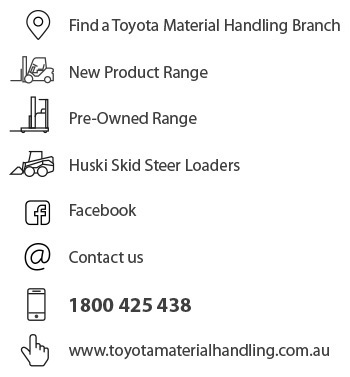 In another remarkable example of Toyota Material Handling Australia receiving the latest technologies shared from the Toyota Group’s automotive division, a pair of hydrogen fuel cell-powered forklifts have been put into action here in Australia. 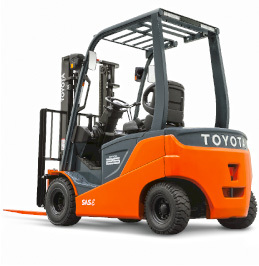 Whilst only here on a trial basis and not available for sale in Australia, the hydrogen fuel cell forklifts are a clear demonstration of Toyota’s commitment to the environment as they do not emit co2 or substances of concern (SOCs) during operation but, rather, only water. Together with Toyota's automotive fuel cell car the "Mirai", these products represent next generation technology producing zero emissions and water that is actually good enough to drink. 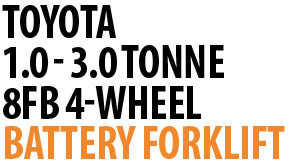 The feature packed Toyota 8FB battery-electric forklift! With high energy efficiency, outstanding safety and driver comfort, it delivers excellent power and performance all with zero emissions. Quality engineering sees the 8FB forklift achieve a high water resistance meaning it can work as comfortably outside as it does inside, and along with the diverse range of options available it's one of the most versatile forklifts on the market.